Make FREE 224 and 6mm jackets! The equipment required for .224 jackets is the RFJM-22S for Corbin S-Press, RFJM-22R for reloading presses having standard T-slot rams like the RCBS series, and RFJM-22H for the larger Corbin CSP-2, CSP-2H, and CHP-1 HydroPress. Usually it is best to operate these presses in the long or reloading stroke mode, instead of the short or swaging stroke, when drawing cases. A .224 jacket maker has a threaded die (7/8-14 body for S-Press and reloading presses, 1.5 x 12 thread adapter for use in -H presses) and a separate drawing punch. 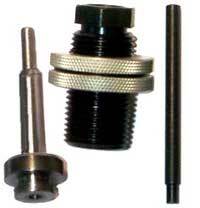 The punch for the S-Press is threaded with 5/8-24 thread shank for the S-Press ram. The punch for a reloading press has a button base like a shell holder, to fit a T-slot ram. The punch for any of the Corbin -H presses has a base with a 1-in x 12 thread, to screw directly into the larger ram. Earlier versions of the draw dies, illustrated in old books, used an ejector device made of a disk and tube, which fit around the press ram. When the ram was lowered, the tube came to rest on the frame of the press, and supported a disk with a hole, through which the punch was drawn to eject the jacket. Today's version uses a longer drawing punch, and simply pushes the case all the way through the die in one stroke, which takes slightly more effort but is more efficient. If the effort seems too great it is because the die is set to low in the press head. There is a fine point between having the die too high to strip off the jacket, and having it too low to get good leverage, but you can find it with a little experimentation. Clean some .22 LR fired cases by boiling in water to which some detergent has been added, then rinse in hot water and allow them to dry. The hot water rinse can help shine tarnished cases if you add an ounce of vinegar to a quart of water. A tablespoon of salt also helps clean the cases, but then a clear water rinse is necessary to remove the salt. Stress relieve the cases by putting them through a self-cleaning cycle in an electric oven, or do the same in smaller lots by heating them to a faint red glow in a dark room using a propane torch (just a few seconds of flame is sufficient). This prevents folding of the ogive when you form the bullet, a result of the case being brittle. Too much heat results in softening the shank to the point where the bullet will acquire dents around the shank area. Between these two extremes is a wide range where the jacket you make will produce excellent bullets. Put the punch in the press ram and screw the die a few turns into the press head. You need at least three full threads engagement of the die in the press head. Normally the die will be set fairly high in the press to use the maximum leverage for easiest operation. Lightly lubricate the case and the punch with Corbin Swage Lube (a thin film wiped on with your fingertips is sufficient). Place a 22 LR case over the punch, and raise the ram. Adjust the die position so that the case is pushed into the die, the head is drawn out, and the jacket is stripped off the punch and remains in the die, high enough so that it is free of the die constriction (loose in the guide section of the die, above the drawing area). The setting is fairly critical...just part of a turn up or down can make the operation require too much force, or not quite get the jacket through the die constriction. Push all the 22 LR cases through the die one after another, picking them up as the start to emerge from the top of the die. You have just started making a lifetime supply of free .224 jackets! Turn them into bullets with any of Corbins bullet swage die sets for .224 caliber. The jackets can also be drawn to .204, .172, or even down to .142 in two or three steps with additional draw dies. The RFJM-22R fits a standard 7/8-14 thread head, t-slotted ram reloading press (if it is capable of accepting standard RCBS shell holders). The RFJM-22S die fits the Corbin S-Press (CSP-1), and the RFJM-22H fits the larger Corbin Mega-Mite (CSP-2), and Corbin Hydro Press. To make 6mm jackets, a flared punch with a profile like a bottle-necked cartridge case is used. This punch, with its ejector tube and disk, is the only difference between a RFJM-22R and a RFJM-6MR die set, so you can just get the punch and make both calibers in your reloading press! However, you do not push the jacket all the way through the die as with the .224. Instead, you merely push it far enough into the die to iron out the rim, and to flare the mouth. This jacket is really a jacket preform, not yet full diameter. The full diameter of 6mm is achieved by expanding the jacket while the lead core is seated into it. The flared mouth acts as a pressure seal and holds the lead pressure inside during the seating process. In the Corbin S-press, a special automatic ejecting die and punch set is used. The 6mm jacket making die screws into the press ram, and has an internal punch which pushes the jacket out on the down stroke. The bottle-necked or stepped draw punch screws into the floating punch holder, in the press head, in place of the usual hex bushing. To use the die set in your Corbin S-press, put the internal punch and die into the press ram and screw the die down hand-tight only. Remove the hex bushing from the FPH-1-S floating punch holder, which is the 7/8-14 threaded cylinder that screws into the top of the press. Normally it would hold a punch with the hex bushing. Instead, the RFJM-6MS punch screws into the body of the punch holder, in the same place normally used by the hex bushing. Adjust the position of the punch so it just pushes a 22 LR case into the die far enough to (a) unfold the rim and iron the top smooth, and (b) flare the mouth of the jacket. Do not force the 22 case any further into the die or over the punch shoulder than is necessary to do this. It is easiest to do consistently with the ram close to the top of the stroke and the punch holder set high in the press head. Always make sure you have at least a full two threads (or more) of engagement between the punch holder and the press head. If you don't use at least that many threads to hold the punch holder in place, the threads of the press head or punch holder may be damaged. FPH-S2H adapter -- screws into the FPH-1-H floating punch holder, replacing the standard hex bushing, and providing a 5/8-24 thread to accept the punch base. CHP-S2H adapter -- consists of a threaded ram adapter which screws into the 1 x 12 ram thread, and accepts the 5/8-24 die. A second part is an H-type punch head with a rod or short extension on one end. This is a dummy -H punch, which allows the larger press ram and ejection system to operate the much smaller and shorter -S type punch supplied with the die. Please note that the RFJM dies do NOT make a completed bullet: they turn the fired .22 case into a jacket, which in turn can be used with appropriate swage dies to make the bullet. Orders may be placed by phone, fax, e-mail, or regular letter, and both VISA and MasterCard are welcome as means of payment. There is never an extra charge for using your bank card. Payment may also be made by check, money order, or direct wire transfer (call or write for procedure) with a $20 additional bank fee. Cash or money order COD shipments can also be made in the USA and Canada by UPS. Order on-line from our secure server shopping cart! The thin 22LR cases are made with a somewhat brittle 30% zinc/copper brass alloy, which requires annealing if you wish to form a small tip. The drawn cases should be annealed after they have been formed. To anneal, simply bring them up to a dull red glow in a dimly lighted room using a propane torch. Some self-cleaning ovens also get hot enough to anneal the cases. Or you can put them through an electric furnace at 1200 degrees F., just long enough to assure that they actually reach that range of temperature. The fold in the ogive area occurs when the case is not soft enough. That's it. If you get a fold, the case has not been annealed at a high enough temperature. You can sometimes avoid annealing if you make a large lead tip, because then the end of the jacket does not have to draw down to as small a diameter, and the jacket is supported all the way to the tip with the lead. Otherwise, it is required to avoid folding. The opposite of too hard is too soft. If you anneal too long or at too high a temperature, the brass will either be "burned" and oxidized heavily, or it will become so soft that it cannot support the force of pressing on the base to form the nose, and it will buckle inward in what looks like lube dents around the circumference, in the shank area. Once the material has been made too soft, the only way to harden it is to work it by drawing to a smaller size, like 204 or 17 caliber. There is no heat/quench process that will reharden the brass, unlike steel. If you find that the heads of the .22 LR cases pop off or punch through when you are drawing them, it could be that you have adjusted the die too low in the press (too close to the ram). The press then works in a low leverage mode as the head enters the die, and requires considerable effort to force it through. The sudden jerk releasing this force on the handle may be resisted by the friction and interia of the material just enough so that the punch is driven through the end of the jacket, breaking off the head. To cure this, set the die higher in the press and use the more powerful leverage toward the end of the stroke. This relieves the effort you must place on the handle, giving a smoother and more controlled stroke. If the heads still pop off frequently, it could be a batch of cases from a run of .22 ammo that was unusually thin or brittle, but more likely it could be an undersized die or oversized punch. The die hole should have a minimum diameter no less than .219 inches (up to .220 still works). The punch should be about .199-.200 diameter. Incorrect diameters are extremely rare, but the possibility exists. Rimfire cases have a fine ground glass abrasive material inside the rim to help ignite the primer. As you unfold the cases, this small amount of abrasive grinds on the end of the punch and wears a groove in it about 1/32 of an inch from the tip. When the wear becomes sufficient, it will begin to cause the case to unfold without fully drawing to the .219 diameter necessary to eliminate the rim completely. This manifests itself as a groove or ring around the end of the jacket. As the wear on the punch continues, the groove becomes deeper until the jacket actually folds over itself toward the end, making almost a double layer where the jacket material first goes into the punch groove and then folds over itself. The only cure is to replace the worn-out punch or grind off the last few millimeters to get rid of the worn area. The punches are long enough so you can grind off the tips one or two times before the punch becomes too short. But hardened replacement screw-in punches with 6mm threads on one end are available as the RFJM-ROD part number, for much less cost than the entire punch. To replace the rod, you will need to hold the punch with a pin vice or secure 3-jaw chuck and turn it without making scratches from slippage. 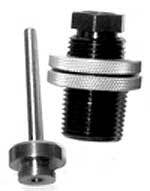 The punch button or adapter body can be held with a lathe chuck or leather-padded V-way cut in a set of vice jaws. If you set the die higher in the threads of the press, it should be adjustable to a point where the jacket is drawn completely through the tightest part of the die (it might not come out the top on one pass, but the next jacket or two will lift it out). If you set it much lower than this, the effort goes up exponentially with every turn toward the ram. Without much adjustment, you can go from a moderate one hand operation to having to jump with both feet on the handle! Unfortunately, a few people don't realize that a compound leverage press has this large range of leverage with fairly small differences in ram position. A famous gun writer who shall remain nameless to avoid embarassing him once got a set of Corbin .22 dies for review, and promptly broke the front of his reloading bench by failing to set the die properly, and applying more and more force instead of considering whether there might be a better answer. Instead of calling to find out why the operation seemed so difficult, he just powered it with all his might until something snapped, in this case the edge of the bench where the press was mounted. Don't be like the unfortunate gunwriter: if something seems too difficult, it's likely that isn't the right way to do it! Call, write, e-mail, send a fax, come by and see us...do something besides getting a bigger hammer. It's a lot easier on your equipment. There are very few operations in bullet swaging that require more than a moderate one-hand effort on the press handle, if things are set up and operated correctly with the right materials. Nothing about making a .224 or .243 caliber bullet or jacket should take more effort than resizing a case. If it seems to require more, stop and find out why. Probably you are doing something that wasn't ever intended to be done that way. Be sure to use Corbin Swage Lube to reduce friction and prevent sticking. It works!